Guest of the Ladies, Frank Reiter, visited his local market earlier this year and found there were treasures to be found. Read about what he found and what he created below and find more of his culinary adventures on his blog at http://www.frankaboutfood.net/. During the warmth of the summer, it is relatively easy to stroll through the vendors at the Webb City Farmers Market, and conceptualize dishes and menus with the plentiful produce available. However, during the cold days of winter, it can become a bit more challenging. When Eileen (one of the Market Ladies) approached me about tackling such a task, I was a bit pessimistic. As I walked though the vendor tables one chilly Saturday morning, a few items caught my eye. Obviously the honey from Amos Apiaries is a staple product at the Market. Another table had shelled walnuts for sell. My mind began to pick up on these two items and move toward a sweet delight, such as baklava. Then, something happened… I spied some fresh basil on a produce table. Something clicked in my head, and I thought to myself about how basil and honey often can work in harmony with each other, in careful balance. Well, the result of what happened next is printed below. The basil and honey play well together, and perhaps the basil even adds a little complexity to the flavor profile you expect in baklava. The savory, herbaceous hint from the basil really helps knock down a bit of that cloying sweetness from the Mediterranean & Middle Eastern dessert. 2. Combine the nuts, cinnamon, and breadcrumbs in a bowl. 3. Brush a 9×13 baking dish with some of the butter. Layer 5 sheets of phyllo into the dish, brushing each piece with butter before adding the next. Be sureto keep the remaining phyllo covered with a damp towel, to prevent drying out. 4. 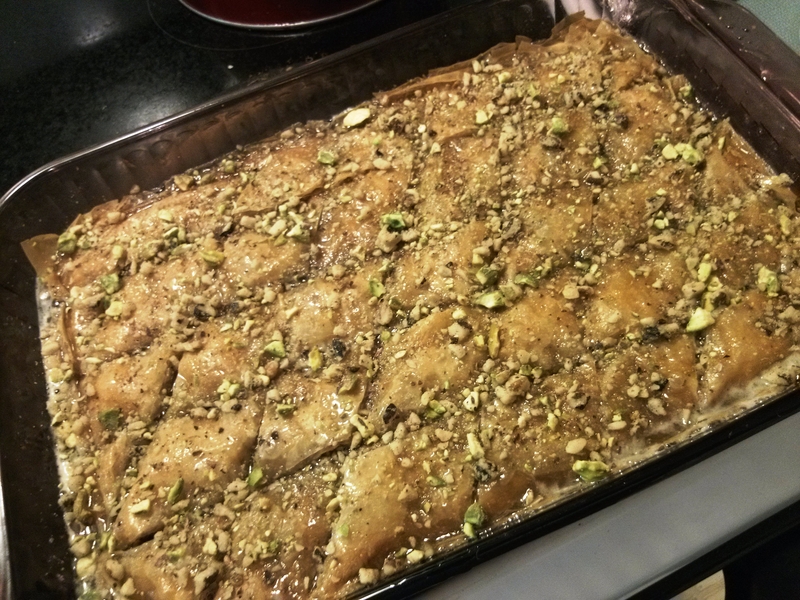 Sprinkle ¼ of the nut mixture over the phyllo. 5. Add 2 sheets of phyllo on top, brushing with butter between each sheet. Sprinkle another ¼ of the nuts over those. 6. 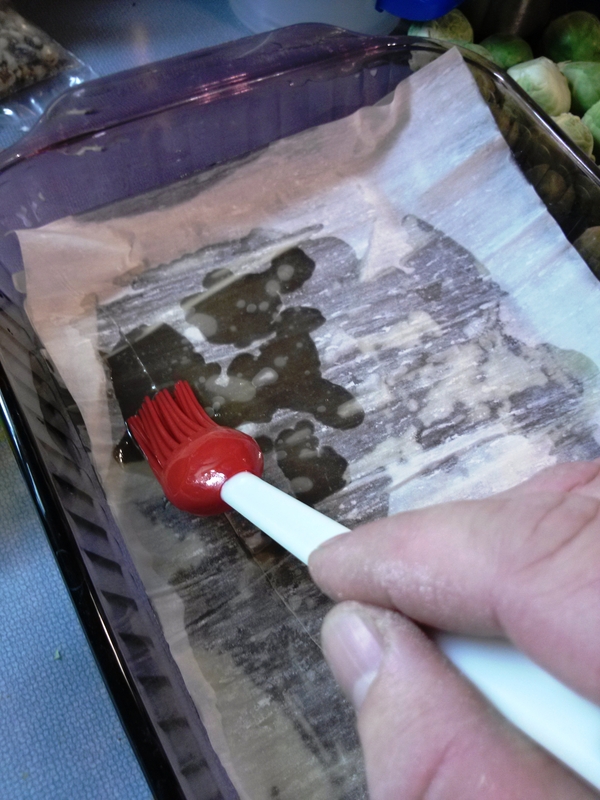 Add 2 more sheets over that nut layer, brushing with butter between each sheet. Sprinkle another ¼ of the nuts over those. 7. Repeat step 6. Sprinkle the last ¼ of the nut mixture over those. 8. Layer the remaining 5 layers of phyllo on top of the nuts, brushing between each layer of dough. Brush the top piece with extra butter. 9. 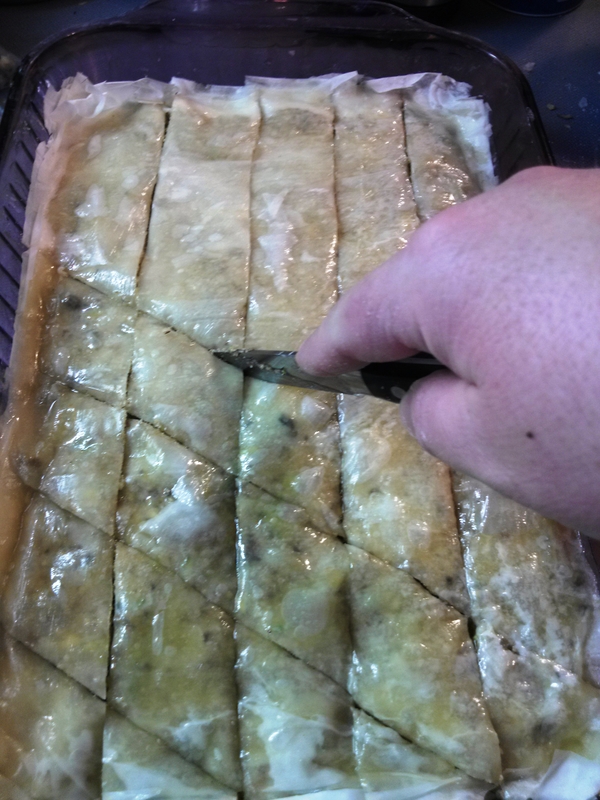 Cut into the baklava to make strips, about 1.5 inches wide. Then, makediagonal slices, about 1.5 inches apart, to make a diamond pattern. 10. Bake until golden, about 30 minutes. 11. Bring the sugar, honey, and water to boil in a saucepan over medium-high heat. NOTE: use a larger saucepan than you think you need; it will try to boil over! 12. Add the fresh basil and continue to gently boil for 10 to 15 minutes. 13. Add the fresh lemon juice, and boil for 2 more minutes. 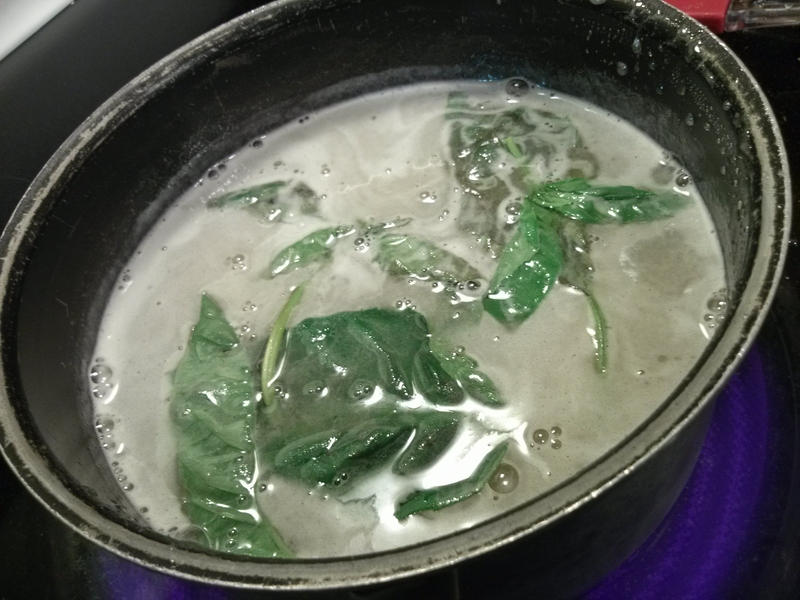 Remove from heat,remove the basil, and allow to cool, slightly. 14. 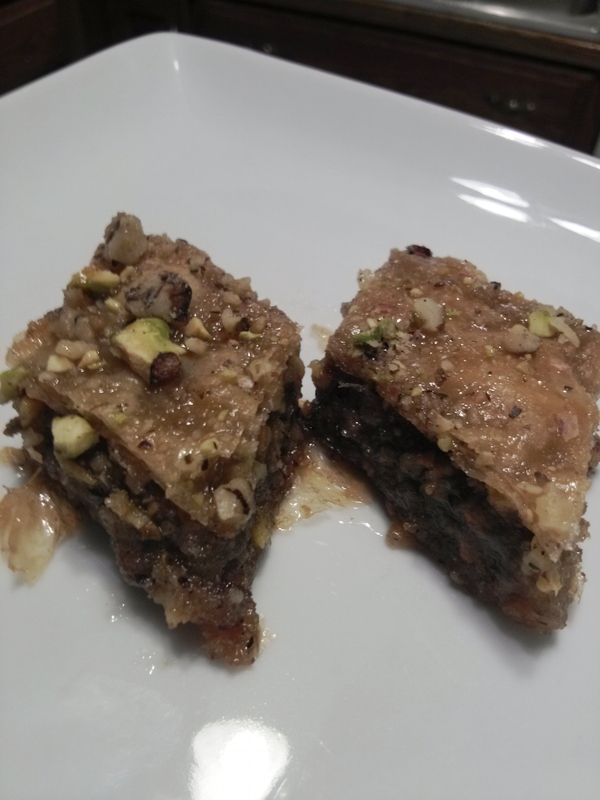 Pour the syrup over the warm baklava. 15. Let soak, uncovered, at least 8 hours, or overnight. Garnish with the extra nuts.